Elizabeth is a charming and sophisticated cat. She was found by a kind stranger, who opened her home to her and her five siblings. During the severe cold snap, the kittens had suffered from frostbite on their ears and paw pads. The kindly caretaker contacted Regina Cat Rescue to assist and from then on out the kittens have grown healthy and strong. While initially Elizabeth seems shy, once she gets to know you, the reservations fall away and she shows her true colours: sweet, playful, and dare we say, just a touch regal, as per her name implies. A loving and curious cat whose temperament is good with other cats, Elizabeth would make a great animal companion in a home with or without other cats. If given the chance to warm up, she'll surely delight. And it will be seen, that for a small kitty, a strong name like Elizabeth was just the right name for her. 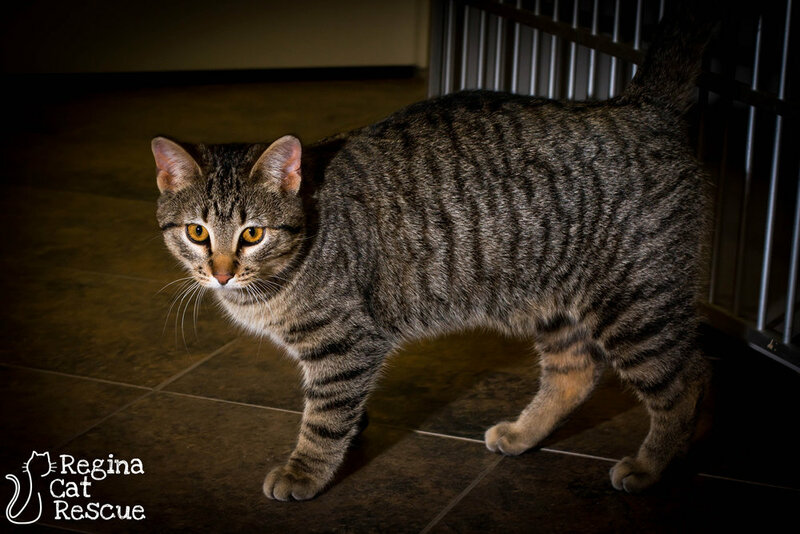 If you are interested in Elizabeth, click here to view our adoption contract and click here to complete an adoption application or email the RCR Adoption Coordinator at adoptions@reginacatrescue.com for more info. Other information: Good with kids, dogs and other cats. You can meet William at Excalipurr Cat Cafe (2156 Albert Street, Regina). William and his five siblings were found stray outside during a stretch of severe winter cold. A kind woman let them into her home and provided care for them, but not before most had suffered frostbite damage to their ears and paw pads. 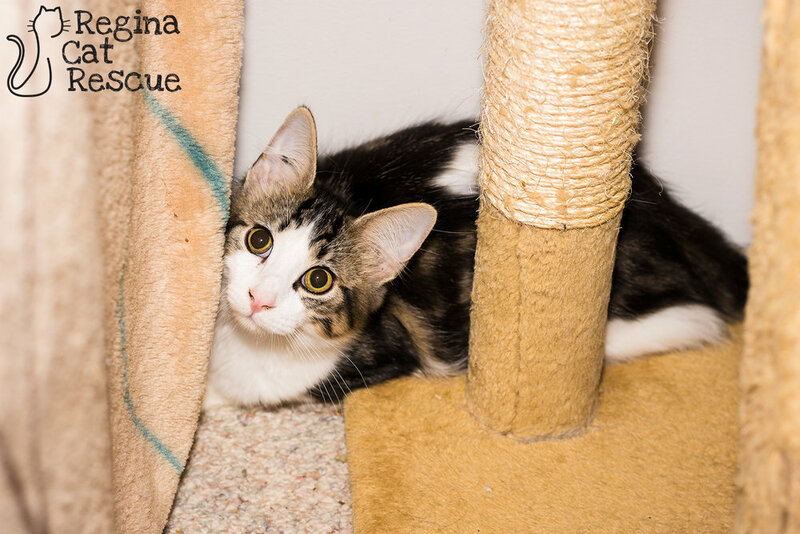 She contacted Regina Cat Rescue for help and they were placed into foster care where they received lots of TLC before being listed for adoption. William is the only male in the litter, and he's a true ladies man — he's handsome, charming and very affectionate. This little fellow may be the man of your dreams if you’re seeking a loving feline friend who enjoys cuddles and never judges! William is easygoing, loves to play and is generally just a happy little guy who likes to be with people. 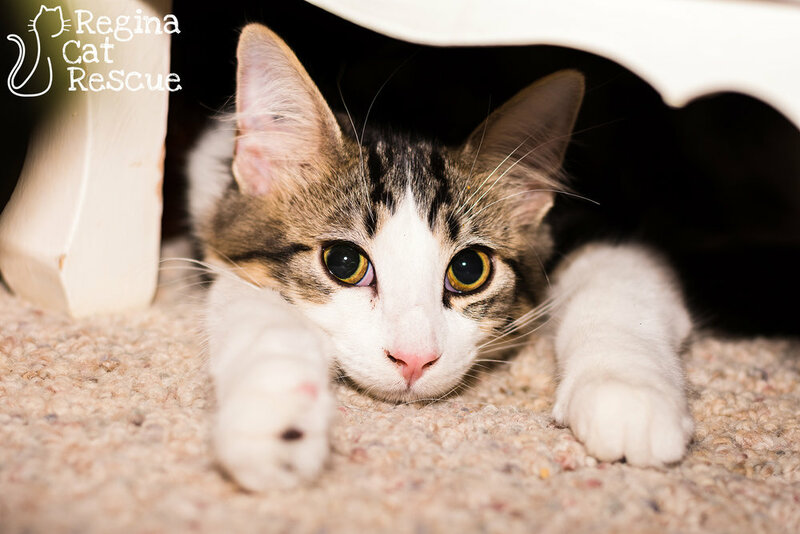 If you are interested in William, click here to view our adoption contract and click here to complete an adoption application or email the RCR Adoption Coordinator at adoptions@reginacatrescue.com for more info.